Bulgaria has denied claims of responsibility for the suicide attack on an Israeli tour bus last week by a small Muslim terrorist group. Bulgaria has denied claims of responsibility for the suicide attack on an Israeli tour bus parked outside Bulgaria's international airport in Burgas last week by a small Muslim terrorist group. The group, which calls itself Qa'adat el-Jihad, claims to be linked to the international Al-Qaeda terrorist organization. But investigators from the Bulgarian government have reached the same conclusion as Israel and the United States: On Saturday, the Bulgarian Foreign Ministry told reporters that government officials believe the lethal bombing was carried out by the Iranian-financed Hizbullah terrorist organization, despite the group's denial of involvement in the attack. Officials are now seeking a second suspected terrorist as well, believed to be the bomber's accomplice. Bulgarian media reported on Sunday that it is believed the suicide bomber received assistance from a man who was seen in the resort city of Varna in the country. Many Israeli tourists regularly visit Varna, which is about 150 kilometers from Burgas. Five Israelis, including a pregnant woman, and one Bulgarian national, the driver of the tour bus in which the tourists were to depart from the airport, were killed in the conflagration. In addition, 35 others were wounded, including three who were critically injured. 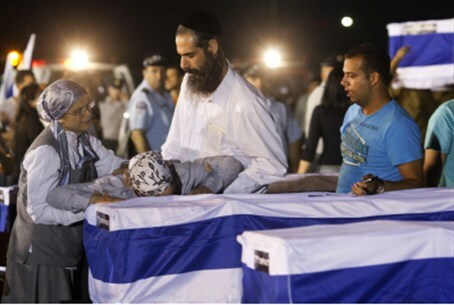 On Friday, Israel laid its victims to rest after their bodies were recovered through the efforts of the ZAKA organization, which accompanied them home on an IAF Hercules military aircraft. Most of the wounded had arrived earlier in the day, also via military transport, accompanied by IDF and Magen David Adom paramedics. The three critically wounded victims, hospitalized in Sofia, were to arrive later on a separate transport.